The Romanesque Revival market house, pictured above, was built in 1889. Today, Central Market is home to many families that have been coming to the market for generations. Photo courtesy Lancaster Central Market. What better time than National Farmers Market Week to explore the history of farmers markets in the United States? Farmers markets are a critical ingredient to our nation’s food system, and date back to 1730 in Lancaster, Pennsylvania in the United States. "Meet me at the Market" has for decades been a phrase commonly heard by Lancaster citizens. In 1730, when city planners designed the city they designated a 120 square foot lot in the center of town as a public market place giving birth to the Lancaster Central Market. Over the years the size of the market and the number of vendors has changed, but there’s evidence that the farmers market may have had 400 vendors at one point in time. The buying and selling of fresh, local produce, meats and baked goods was so essential to daily life - especially in a market town like Lancaster - that from 1818 until after World War I several "curb markets" sprung up around the town as well. These "curb markets" consisted of local farmers and merchants setting up their wagons on the curb of the streets and selling their goods to the community. The current Romanesque Revival market house was built in 1889. Today, Central Market is home to many families that have been coming to the market for generations. In 1995, it was designated one of the "Great Public Places" in America. 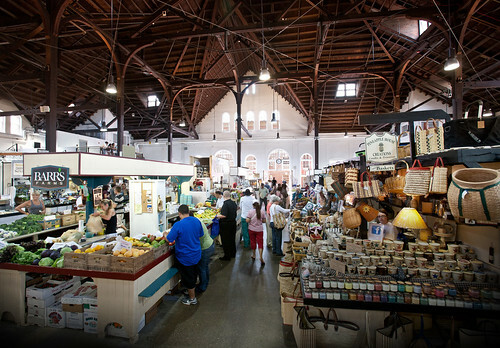 The original vendors at the Lancaster Central Market would find it hard to believe that today there are over 8,000 markets operating throughout the United States. The USDA National Farmers Market Directory helps connect farmers and consumers, communities and businesses around the country. And, thanks to wider use of smartphones and enhanced search tools like our directory API, consumers can search for farmers markets using mobile phone apps while on-the-go. While much has changed over the years, one thing remains true – farmers markets are a vital source of fresh, locally produced foods with strong ties to our nation’s history. I think one of the biggest threats to farmers markets is urban sprawl. Our cities keep expanding farther and farther out and some of the best farmland for growing produce, etc. is near our big cities. I don't think developers really give a hoot as long as they make their money on selling lots for new housing developments. For all they care, they probably would be happy getting all our food from China. Urban sprawl is a concern and it does not make sense to build further out when we have so many vacant homes and businesses in the city. I don't want to get my food from a foreign country as i view it as a national security concern, my stomach can not digest a concrete sandwich and I do not want to chip up any more of my teeth than what I already have chipped. Farmer’s markets are a great way for small scale and specialty producers to make a decent living. John’s comment, however, is the height of talk-point-repeating ignorance. About half of America’s farmland has been taken out of production since 1950 because productivity has increased so drastically. We export massive amounts of food around the world, and our farmers struggle because supply is usually so much greater than demand. We have enormous stockpiles of cheese, and we are burning food to run out cars. Farmland is under zero threat from “sprawl.” In fact, the exact opposite is occurring. The countryside is emptying out because of the high efficiency of modern farming and people are collecting around towns and cities. You should have some basic grasp of demographics and history before echo-chambering those who want nothing more than to force others to conform to their dystopian ideals.